When we arrived back in Los Angeles our car’s speedometer read almost 10,000 miles more than when we had departed on our trans-continental safari five weeks before. We were hunting big game, shooting synagogues, photo-shooting that is. In preparation for the safari, I had spent four months selecting the targets, arranging photographic permissions and access. In all, we planned to photographically document 35 synagogues ranging from humble shuls established by early immigrants to modern architectural wonders erected by their offspring. Locating and selecting synagogues to photograph is no small chore. There is no comprehensive list of synagogues. 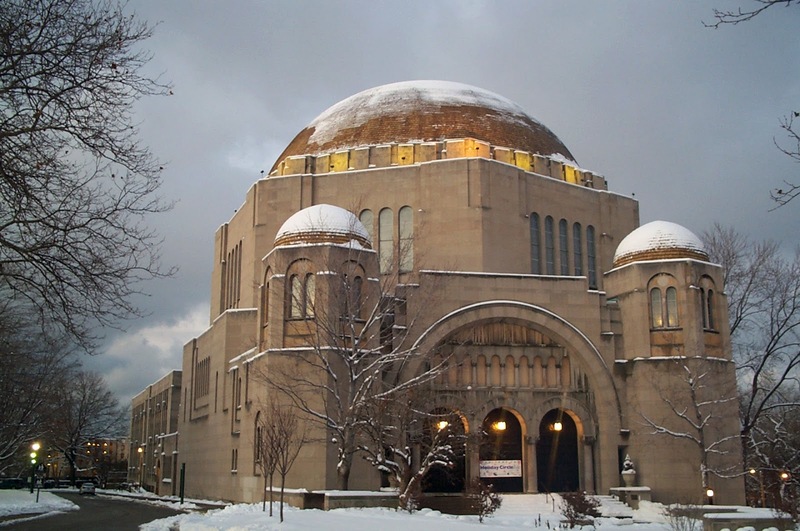 Many synagogues are not affiliated with any of the mainstream Jewish movements. I use every information source available to find synagogues, lists, books, word-of-mouth and internet searches. From this huge list, I cull those that have special interest such as oldest in a particular state, unusually fine architecture or artwork, home of a particular Jewish movement or scholar, etc. Arranging photographic permission is the next and most challenging step. Synagogues that are large enough to have fulltime staff are relatively easy to get in touch with, however the vast majority of synagogues aren’t that large. Even small synagogues tend to have websites, yet if a phone number is shown there is no one there to answer except during services, when the phone is definitely not answered. If an email address is shown, inquiries almost never receive a response. The case of the Walnut Street Shul in Chelsea, Massachusetts is a good example of the detective work required to gain photographic access. My research revealed that this particular shul, dedicated in 1909, is a very fine example of a shul built by working class Jewish immigrants who crossed the Atlantic in steerage class around the turn of the century. The sturdy stone and brick building with a fancifully painted ceiling survives, though most of its congregation have prospered and moved to the suburbs. Only a handful of older Jews remain in the neighborhood, clinging to this building that was the center of their community for so many years. How to contact them? Trolling the internet, I found mention of a Rabbi Nochum Cywiak who had once served the shul. My internet searches failed to find the good Rabbi but did turn up a glatt kosher butcher in the Boston area by the name of Cywiak. Not a common name. So, on the chance that one Cywiak might be related to another, I phoned the butcher at his place of business. When I explained my mission, that I was searching for Rabbi Cywiak, he exclaimed, “That’s my father!” Mr. Cywiak said that his father was no longer affiliated with the Walnut Street Shul because the congregation was too small to need or afford a rabbi. However, he quickly gave me contact information for the gabbai, a cordial gentleman who welcomed my photographic documentation efforts. Dealing with un-staffed synagogues is kind of like football: there can be all manner of fumbles. We had made an appointment to photograph the synagogue in a somewhat remote town in the northern Great Plains. After driving 235 miles, we waited in front of the synagogue. And we waited, and we waited. Finally, I called the synagogue president on his mobile phone. He explained that he had been called out of town on business but had arranged for a person to meet us. Calling us back a few minutes later, he explained that the person who was to meet us had inadvertently forgotten the rendezvous and gone on vacation. “So sorry. Maybe next time” he said. 235 miles from nowhere, I felt like a bride who had been left at the altar. There wouldn’t be a next time. As my wife, dog Harley and I stood in front of the synagogue pondering our next move, a red-haired lady walked by pushing a baby carriage. A brief bit of conversation ensued. Although not Jewish, she gave art lessons from her nearby home and some of her students were Jewish. For some insane, convoluted reason that I no longer remember, she had keys to the synagogue. Bingo! We’re in. The moral: talk to the locals. Speaking of talking to locals, we arrived in Jefferson City in the late afternoon and went for a walk into town to check out the restaurants for dinner later. Just two blocks from our hotel, we spotted a wonderful old synagogue that we hadn’t known about. Of course, it was locked. However, in the parking lot of an adjoining building, a lady was getting into her car. We asked her if she knew how we might gain access to the building. She happened to have a friend who was recently married there and was on her honeymoon. She got out her cell phone and called the honeymooner. No answer. But she thought she remembered the name of the groom’s parents. Later, back at the hotel, I looked up the name and called. As it turned out, there was a Sisterhood meeting at the synagogue that evening and they were thrilled to have us take photographs. I don’t know how much of a meeting they had, as after the photo-shoot, we spent a delightful hour visiting with the group. Here we are, having used up much of your eyeball time and I haven’t even gotten to the point of this blog: to tell about this summer’s 10,000 mile USA synagogue safari, so I’ll just touch upon some high points. That’s not easy either, because the 35 synagogues turned into 39 and there weren’t any low points. Among the most amazing modern synagogues documented on the trip were those in Glencoe, Illinois and Bloomfield Hills, Michigan both designed by Minoru Yamasaki, architect of the World Trade Center. (Talk about keeping up with the Joneses.) These unique structures remind me of gossamer wings floating in their lushly wooded surroundings. 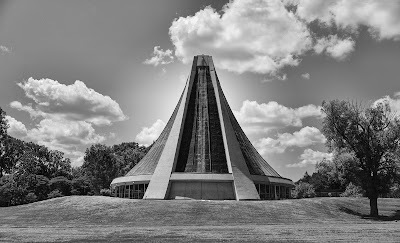 Then there was Synagogue B’nai Jacob of Woodbridge, Connecticut, a modern-day stained glass extravaganza and The Park Synagogue of Cleveland Heights, Ohio, a remarkable and serene Art-Deco structure sprawling across a spacious green campus replete with a family of gamboling deer. Another star in the modern sky was in Rochester, New York , Temple Sinai, an airy, vaulted concrete shell with a glass bema wall visually bringing the forested outdoors right into the sanctuary. There were fine historic synagogues too. In Jefferson City, Missouri, we photographed the little white-washed brick synagogue, mentioned above, that lays claim to being the oldest continually used synagogue west of the Mississippi River. Less active but no less historic, nestled in New York’s Adirondack Mountains we found Beth Joseph Synagogue of Tupper Lake. Janet Chapman, 92 years young and the keeper of the keys at Beth Joseph is a veritable fountain of information. Leaving Tupper Lake, we drove to the very active Berith Sholom of Troy, New York, a fine example of Victorian architecture. In the historic old central city of Philadelphia, we photographed two decisively different immigrant shuls that resonated with us as much as the city’s Liberty Bell. (Unlike that symbol of freedom, there were no long lines waiting to get into the shuls.) Old, central Philadelphia is composed of ethnic neighborhoods with row houses of various eras dating back to Colonial times. Congregation Shivtei Yeshuron Ezras Israel is a big name for a small row-house shul founded in 1876. 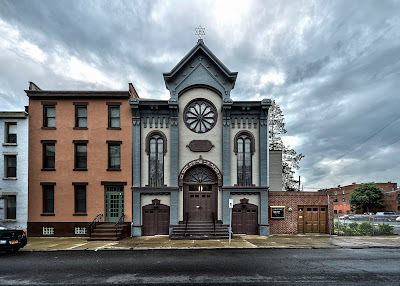 Continuing to hold services on a regular basis, this little orthodox shul, a rebuilt colonial row house, is the last remains of one of the largest Jewish populations of the United States. The shelves are stocked with old Hebrew books covering topics from how to deal with witchcraft to proper hairstyles for women and dietary rules. We also photographed opulent, palatial synagogues built between the wars. These I describe as “jaw droppers” as my mouth simply gapes open and my eyes go wide upon entering their magnificent domed sanctuaries. 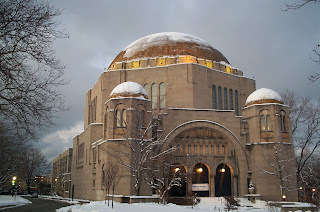 To mention a few such sensational synagogues: Rodef Shalom of Pittsburgh (Arts & Crafts era style), KAM-Isaiah of Chicago (Byzantine style), as well as Tifereth Israel of Cleveland and Ohabei Shalom of Brookline, Massachusetts. Typically, these impressive edifices were built by immigrants, or their children, who had made it good in America. These were not the houses of worship of those who had just stepped off the ship. In most instances, the populations of Jews who built these temples have left those neighborhoods, moving to suburbs or trendier areas. These once impregnable edifices of faith have in many cases become endangered or unsustainable. We find it particularly important and meaningful to photographically document these before they are re-purposed, like Cleveland’s gorgeous Tifereth Israel which is soon to become part of Case Western University for multi-use as a concert and exhibition hall. To photograph in detail 39 synagogues all across the continent meant we were moving pretty fast. We found out just how fast when, upon getting home, we found a photographically taken speeding ticket from the State of Maryland awaiting. 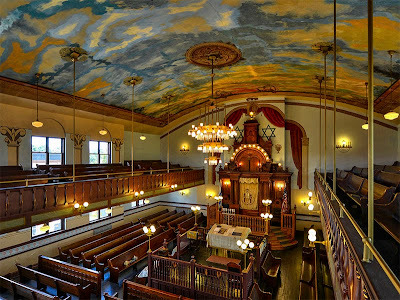 This blog shares stories related to the synagogues displayed at www.Synagogues360.org as well as experiences while photographing these architectural examples of Jewish heritage. Traveling the globe photographing synagogues for posterity is an enriching experience allowing us to visit many lands and see great examples of Jewish art and architecture. It is made possible by the wonderful staff and lay people who have opened their synagogues and hearts to us. An architect by education, now semi-retired, I travel extensively with my wife and dog photographing synagogues.